Alghero is an ancient city on the north-west coast of the island of Sardinia, it's one of the main cities of Sardinia. The first settlements here arose 6 thousand years ago, and the first buildings of the Nurag and the Phoenicians date from 1500-1000 BC. Also this city is known as the Coral Riviera (Riviera del Corallo), as in the coastal waters an expensive red coral is extracted, and the local inhabitants call this city "Little Barcelona". The city as such was founded in 1102 by the Genoese family of Doria, as a port fortified by a powerful fortress. Until now, Alghero has preserved most of the fortified bastions, as no other city in Europe. For decades, for the possession of the city, constant wars have been waged between the maritime republics of Genoa, Pisa and the kingdom of Aragon. In 1283, the Marine Republic of Pisa took possession of the city of Alghero, but held it only for one year, after which the city was again ruled by the family of its founders. In 1347 a plague came to the city, which wiped out most of the population and undermined the military power of the city, so that in 1350 the weakened Doria dynasty was forced to sell part of its city to the Aragonese, and in 1353 Alghero was completely conquered by the Aragon army, and in the 14th century received the status of "royal city". As a result of the conquest, the city was conquered by settlers from Catalonia, displacing the indigenous population. The culture of Aragon and Catalonia has left an indelible mark in all spheres of life in the modern city of Alghero, so much so that some of the inhabitants still speak a dialect closely resembling the Catalan dialect, and the streets of the city have names both in Italian and Catalan, and also in some restaurants you will be served traditional dishes of Catalonia - paella and sangria. At the very end of the fourteenth century, after endless wars, Alghero finally returns under the power of the wife of one of the Dorian family, Eleanor of Arborea. And three centuries later, in 1720, Alghero and the whole of Sardinia passed under the power of the Savoy dynasty, reigning in Piedmont. 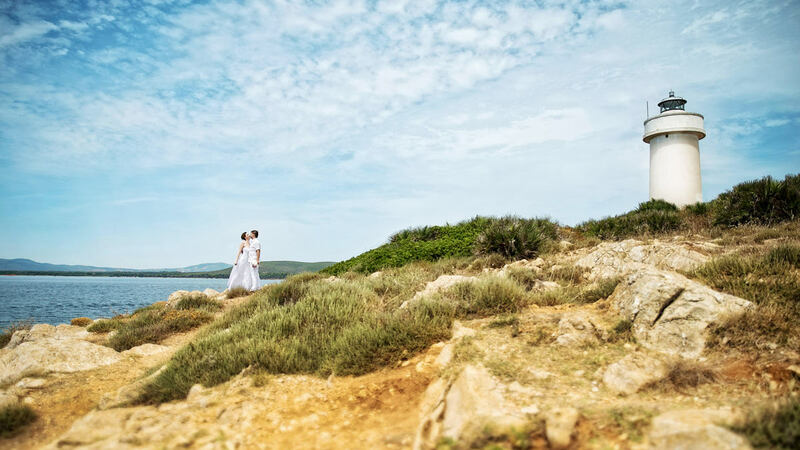 Here, on the outskirts of Alghero, on the beach near Porto Ferro, I organized a symbolic wedding ceremony for one charming couple. We installed an arch from the air cloth right at the shore, and after the bride's preparations at the hotel we came to the seashore for the ceremony. The couple were very tired after the road, but the ceremony was held in a magical atmosphere of love and happiness. After a small aperitif with prosecco and cakes, we done a photo session, capturing the endlessly romantic mood of the newly created new family.